Enjoy the World's Largest Collection! 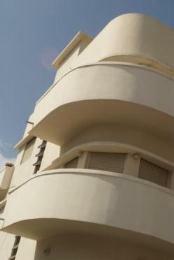 Did you know that Tel Aviv has the largest collection of Bauhaus architecture and buildings in the world? You can see the white, bright and simple Bauhaus buildings all over the central part of the city. Enjoy them as you walk around Rothschild Blvd, and between the area bordering Allenby Street to the south and Ben Gurion Boulevard to the north. The Bauhaus or 'international' style developed around 1920. It espouses simplicity and functionality. In the 1920's, this considered a radically new approach to the preferred ornate style prevalent in Europe. The Bauhaus School of Architecture was established by German architect Walter Gropius in Germany in 1919 and was influenced by LeCorbusier. Both are considered among the founders of modern architecture. Usually the first floor is raised on pillars. For more information on how Bauhaus influenced modern architecture, take a look at this short article. In the early 1900's, the living conditions in old Jaffa were terrible and overcrowded. The original pioneers left for the sand dunes outside Jaffa and built new neighborhoods based on cozy, 1-2 storied houses with charming red tiled roofs. You can see some of these buildings today, especially in Neve Tzedek and Kerem Hateymanim. But these homes could not accommodate the growing population influx that started in the 1920's. 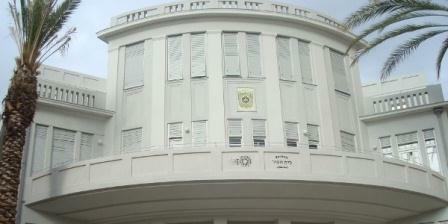 You can learn more about Modern Tel Aviv History here. In 1925, the famous Scottish urban planner Sir Patrick Geddes developed a modern, unique city plan for Tel Aviv. He envisioned lots of gardens and open spaces in between modern buildings. While the Nazis were gaining strength in Europe, Jewish architects escaped to then Palestine. These architects started designing new buildings in Tel Aviv based on their European training in the new International 'Bauhaus' style. Most of these buildings were situated in the area of Tel Aviv designed by Sir Geddes. From the 1930's to the 1950's, over 4,000 new Bauhaus buildings were built in Tel Aviv. They were built by architects such as Shmuel Barkai, Dov Carmi, Ze'ev Rechter, Benjamin Chlenov, Joseph Neufeld, Carl Rubin and Arieh Sharon. 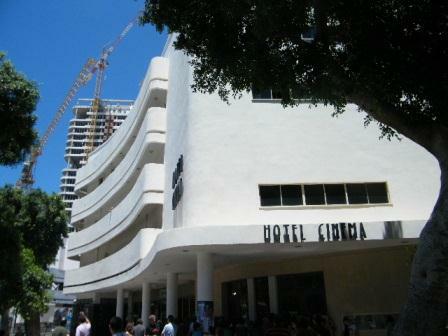 One of the most prominent architects was Yehuda Magidovitch, Tel Aviv's first city engineer who planned over 500 buildings including the Esther Theater, today's Hotel Cinema that you can see above, as well as Tel Aviv's Great Synagogue. Over the years, the Bauhaus buildings were neglected and deteriorated. Absurdly, some were even torn down! About 25 years ago, the city began a major preservation plan for these historic buildings. A flurry of activity and Bauhaus renovation began which hasn't stopped since. Today there are about 1,000 Bauhaus buildings that are intact or renovated, the largest collection worldwide. Their visual effect is striking. Not grandiose and soaring, but creating a feeling of floating based on simple, clean and attractive lines. The Unesco added the 'White City' of Tel Aviv to its list of World Heritage Sites in July 2003. Tel Aviv Bauhaus architecture differs somewhat from the classic International style, mainly because the architects had to consider Israel's climate. The preponderance of window and glass in European Bauhaus architecture doesn’t suit the intense light and heat of Tel Aviv summers, especially in the days before air conditioning! 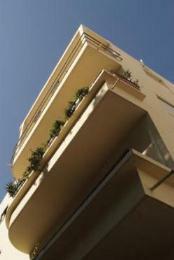 Local architects decreased window sizes and replaced windows with balconies, a great adaption for hot Tel Aviv summers. Bauhaus buildings were designed to catch the Mediterranean sea breeze. Awnings and window shutters which are less typical in classic Bauhaus architecture were used to create more shaded areas. And in deference to the local 'Eastern' influence, some Bauhaus buildings were designed small domes or arches surrounding the doors. So you can see lots of white or light-colored, 3-4 story cubic buildings with little or no ornamentation. Flat roofs, often with gardens. Lots of round corners. Lots of windows and balconies with awnings and shades. 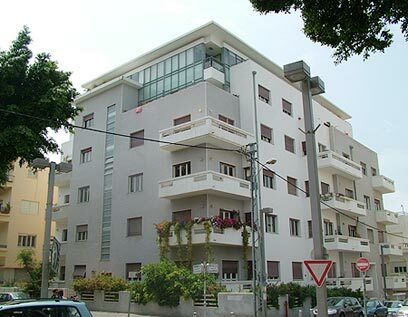 If you want a private tour of Bauhaus architecture, read more about our Tel Aviv World Heritage Tour covering the White City architecture and the history and wonders of old Jaffa. 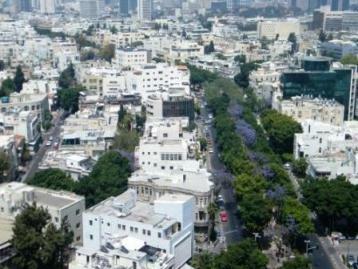 The city of Tel Aviv runs English-speaking, free guided tours of the White City. You get a great overview of the beautiful Bauhaus buildings in the center of the city. Just show up at 47 Rothschild Boulevard, on the corner of Shadal Street. There is no need to book in advance. The free tours run every single Saturday (except for Yom Kippur).